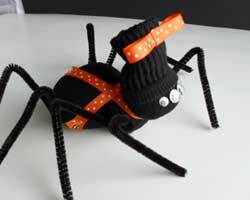 These Halloween sock spiders can be made extra quirky with goofy hats and festive scarves. 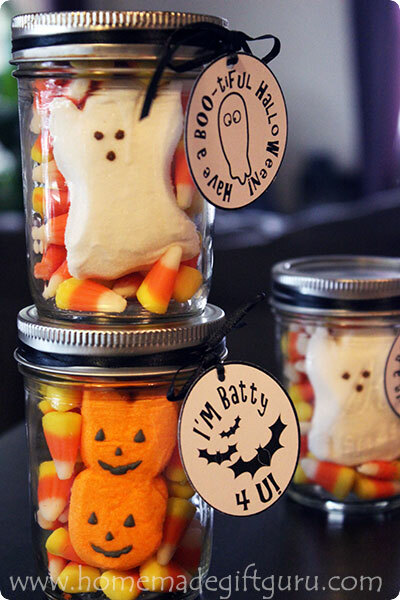 They make cute decorations, festive paper weights and silly homemade Halloween gift ideas. 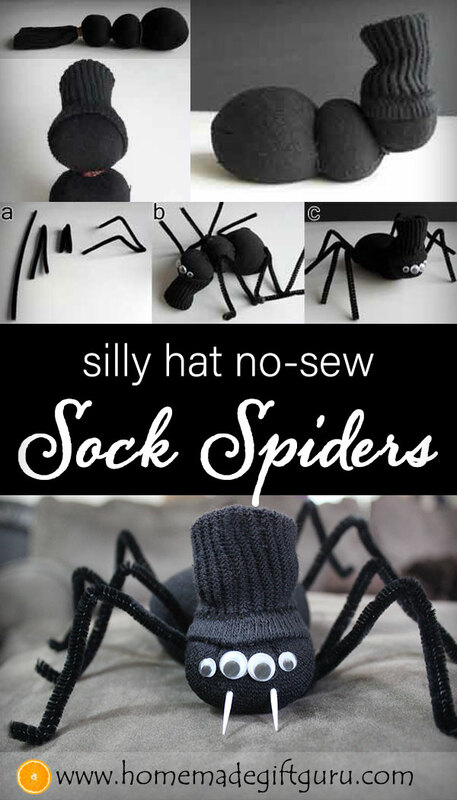 Your sock spider might be a gag gift for an adult (like your best spider-phobic buddy) or it could be a cute addition to a homemade Halloween gift basket, along with a few treats. 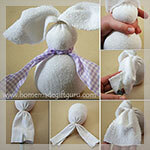 Sock crafts are one of those crafts that are extraordinarily fun to make. Giving them their own personality is the best part. 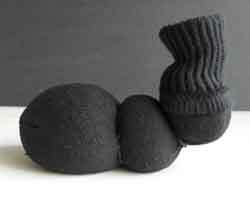 A few years back I made sock snowmen for Christmas presents. 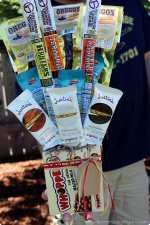 Actually, my husband helped me, which was amazing since he generally doesn't enjoy crafts. Turns out, we both had a blast and we agreed, there is something really special about these little sock guys (and gals). 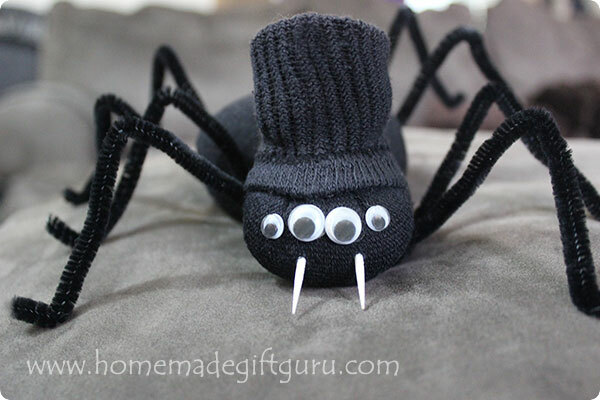 We got so many happy reviews of the sock snowmen, I decided to create a Halloween sock spider, using the same technique... thinking it would be a cute little homemade Halloween gift idea for a child, a friend, co-worker or a teacher. After that came these tube sock bunnies and these adorable baby-sock bunny rabbits (which fit inside large plastic Easter eggs)... I think this proves my love for sock crafts but I'm sure there will be more to come. Not only are sock animals easy and adorable, they make a delightfully cheap homemade gift idea. 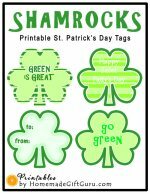 I love the price (less than $1 each if you shop wisely)... and dressing them up is a blast. Try giving them glasses, dressing them or even silly little mustaches (I did this on my yarn octopuses and oh my, so cute!). 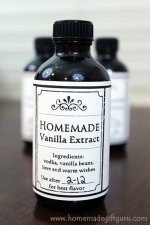 Easy, adorable, cheap and fun. Fill Sock with Rice. Work the rim of the sock around the funnel. Use a measuring cup to fill sock with about one cup rice. Separate the sock into sections with rubber bands, leaving the ridged part of the sock free like below. Make sure your first section is the largest, since this will be the body. Form Hat. 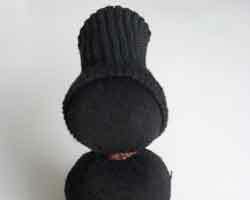 Form a hat by pulling the ribbed part of the sock down over the top section. Leave enough room for the spider eyes and teeth. Glue Sections. Using a hot glue gun, glue together the sections of the body. Glue the head section at an angle as seen below. If the rubber band shows around the neck, that's ok since it can be covered up later with ribbon. Put a couple dabs of glue under the hat to secure it as well. Add Legs and Eyes. First, fold each chenille stem in half twice. Each stem will make two spider legs as seen in figure "a" below. Next, use a small dab of hot glue to adhere a leg set to each side of the two body sections as seen in figure "b" below. Adhere googly eyes as desired. 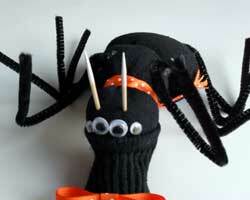 Your Halloween sock spider should resemble the one in figure "c."
Tip: Use glue sparingly because it may show on black fabric. Once the legs are glued in place, I use the gun's nozzle to rub a thin line up the stem about 1/4 inch and I then adhere each leg more securely. You can also sew the chenille stems on. Dress Your Spider. Dress the little guy with a bow, scarf or other fun accessories. Make your Halloween sock spider fashionable using the ribbon of your choice, or a piece of cozy flannel cut to look like a warm fall scarf. Give it personality by creating glasses, mustache or silly clothes. Make tooth pick teeth. Take each toothpick and stick them into your spider's face to make teeth. Use a twisting motion to penetrate easily. Once positioned, pull them out partially and paint the ends white. Once dry, push them back in to look like spider teeth. If a point comes out the back, snip it off so no one gets poked accidentally. Alternatively, you can make teeth out of white felt, for a softer finish. 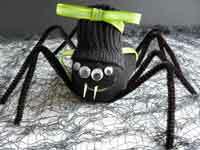 Sock Spiders Make Adorable and Funny Homemade Gifts! Your homemade Halloween spider is ready to go. If you'd like a free printable gift tag to go along with one of these cute Halloween sock spiders, here you go (Halloween Printables)! 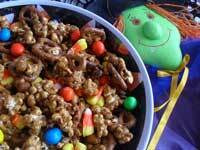 This sweet & salty candy corn studded Halloween popcorn is YUM!